When you are going to move homes, packing becomes paramount. Whether you want to spend a great deal of time on this, or you try and rush through it all, you need to realise that packing takes time. You will need spend a good deal of time putting things in boxes and finding out how you’re going to get from point A to point B. Consider the examples given below as a checklist of essentials for moving home. The idea is to help make the relocation experience as easy and efficient as possible. Duct Tape – You’ll need heavy duty tape for boxes and other incidentals. Packing boxes – Never underestimate the need for plenty of boxes. For an average size house start with 20 small moving boxes, 15 medium moving boxes and 10 large packing boxes as well as approximately 5 heavy duty boxes. Packing paper – Look for paper that is all brown or find discarded newspapers to pack your items with. Plastic wrap or bubble wrap – Wrapping up your furniture for moving is a great plan, and something that can be easily done with a roll of plastic wrap. Box Cutter – A good box cutter will prove incredibly valuable for cutting through cardboard and more. Mattress bag – If you’re going to be moving your matters, then it becomes imperative to have a bag for it. A mattress bag will help with keeping things clean upon moving. Markers – Invest in permanent markers so that you can label all your boxes and ensure that nothing gets lost or left behind. 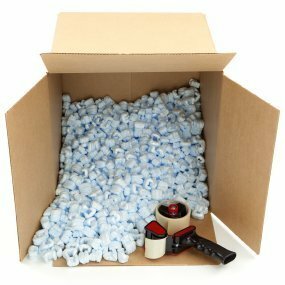 Packing peanuts – For extra peace of mind, foam peanuts could allow you to pack fragile things with more cushioning. Transportation – You will want to have your transportation booked, especially if you’re hiring movers to help. Dolly – Purchase a dolly to help with moving appliances out of the way for cleaning and more.